Find hotel near Charles Karel Buls Founta ..
Buls was a Freemason, and mayor of Brussels from 1881 to 1899. He was quite progressive for his time but his main achievement was to thwart King Leopold II’s attempts to mutilate Brussels. 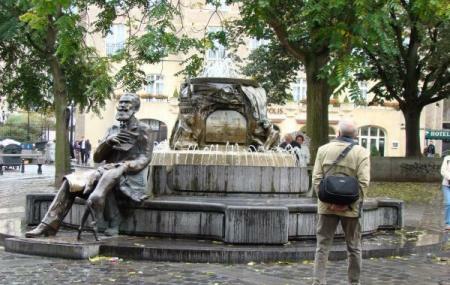 This fountain on Agora Square shows him reclining, his dog by his side, admiring the city he helped preserve. How popular is Charles Karel Buls Fountain? People normally club together Jeanneke Pis and Everard't Serclaes while planning their visit to Charles Karel Buls Fountain. This is a wonderful fountain erected to remember a highly respected gentleman known as Charles Buls or Karel Buls. Charles was a Belgian politician. In remembrance of a great politician. It’s a small square with benches to sit and relax. There is an interesting statue of late 19th-century politician and city Mayor of Brussels Karel (Charles) Buls, which can be seen at Agora Plein a couple hundred metres north of Grand Place. The statue was erected in 1999 and is a life-size depiction of Buls sitting on the steps of a small fountain along with his dog. He is holding a book in his left hand while petting his dog with his right. During December when we visited, there was a Christmas tree mounted atop the fountain, which was turned off for the season. This made for a nice image of Buls this time of year.